You know, I’ve always wondered why it is that I show up in the weirdest search results. 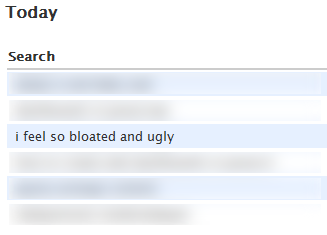 "i feel so bloated and ugly"
Then I realized, that I’m just living up to my page title. I know I shouldn’t make fun of these people, but they make it so darn hard not to. Especially since, most of the time, the fix is as simple as lifestyle adjustment… And/Or therapy. This entry was posted in Society and tagged Culture, Morale, Self image. Bookmark the permalink. :) I have some pretty wierd keyword combinations too from search engines. Strange what people actually type in!